Built in 1917 at the New York Steinway & Sons Factory, Model A-3 #186423 measures 6’4 1/2″ in length. Representing the finest in ‘golden era’ piano craftsmanship, this ‘stretch A’ grand piano has been fully rebuilt. The square arm cabinet has been refinished in satin ebony with a flamed mahogany inner rim. Restoration includes a new solid spruce soundboard, new custom fitted pinblock, a fully rebuilt action, a closed pore refinished cabinet and much more. Contact us today for more information on this or any other piano we have in our facility! Considered one of the finest scale designs ever produced by Steinway & Sons, the Model A-3 Grand Piano has become the preferred choice of numerous high-level pianists and technicians. Steinway Model A-3 #186423 was built in 1917 at the New York Steinway Factory. The A-3 design is the pinnacle of Steinway’s Parlor Grand development. Crafted only for a select number of years amid the ‘golden age’ of piano manufacturing, this piano is a powerful, yet equally delicate instrument. This 1917 Steinway Parlor Grand Piano has been fully rebuilt and is ready for your careful consideration. The Model A-3 was first made in 1913 and these instruments measure 6’4 1/2″ in length making them substantially larger than their Model A-1 or A-2 brethren. (The recently re-introduced Model A is the smaller 6’2″ Model A-2 design.) Extra length combined with an advanced scale design make these rare instruments highly prized and comparable to a larger Steinway Model B. Model A-3 #186423 features a modern styled square arm cabinet. The cabinet has been expertly refinished in a closed pore, satin ebony lacquer with an African Flame Mahogany inner rim. The case rests on window pane, spade style legs with nickel plated casters which match the rest of the piano’s nickel hardware. Our piano technicians have spent the time and effort needed to turn this piano into a true concert level instrument. The piano’s action has been fully rebuilt with new parts. This includes new dimensionally correct Renner wippens (repetitions) and new hammers, shanks and flanges. The piano boasts a full, electrifying quality of tone. Coupled with a responsive, smooth touch, this piano is a stunning example of the capabilities of vintage Steinway Grand Pianos. The belly of the piano has been fully rebuilt with a new solid spruce soundboard, a custom fitted hard maple pinblock and much more. The piano’s keyboard features restored ebony sharps and new acrylic keytops. Steinway Model A3 #186423 was found to be a great candidate for a full restoration and exemplifies the qualities expected of a golden era grand piano. Considered to be the ‘golden age’ of piano manufacturing, the pre-WWII era saw hundreds of piano makers competing to provide their clients with the very finest instruments possible. Leading that way was Steinway & Sons. Vintage Steinway pianos are considered by many to be the highest level of pianos ever made. Here at Chupp’s Piano Service, we are proud to do our part to continue that legacy of craftsmanship. Founded in 1975 by Master Piano Technician Dennis Chupp, we have focused on the rebuilding of concert level instruments for over forty years. Our team of piano technicians and rebuilders are experts at tailoring each of our premium rebuilt pianos to meet your specific tastes and playing preferences. We truly believe that when you play our rebuilt pianos that the quality of our craftsmanship, speaks for itself. Pianos are meant to inspire and we have found that the art of piano rebuilding is true art you can hear, see and feel! Once fully rebuilt, this fine instrument will embody the excellent value, performance, and quality expected of a vintage Steinway grand piano. Contact us today for a private selection appointment by emailing us or calling us at 1-888-831-5820. 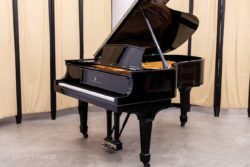 We invite you to tour our Northern Indiana rebuilding facility to view our work and to visit our piano showroom to play our finished and original condition pianos. 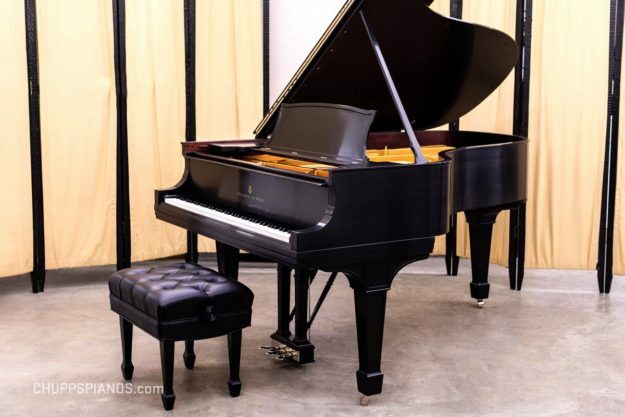 We feature a selection of Steinway Grand Pianos that is uncommonly large alongside vintage Mason & Hamlin, pre-owned Yamaha, and new Kawai pianos. We look forward to answering any questions you might have and helping you find the piano of your dreams! Error: Error validating access token: Session has expired on Thursday, 10-Jan-19 19:00:02 PST. The current time is Wednesday, 24-Apr-19 23:29:09 PDT.